Children have a reputation for a lot of good things. For example, they see the world differently, so they’re known for wisdom from unusual places and have a way of putting things into perspective with remarkable wisdom. So, not only are children philosophers and artists, they’re also adept fossil hunters, as South African paleoanthroplogist Lee Berger discovered. One day, his son wandered away from an archaeology dig at Malapa, South Africa’s renowned “Cradle of Life” and stumbled across an entirely new species of human ancestor. 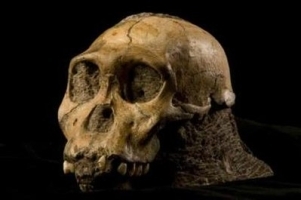 Called Australopithecus sediba, this near-human creature is believed to have been a close human ancestor. They had faces similar to us, but smaller brains (kind of like pinheads). Their hips are nearly identical to modern humans, so they walked up right. They had curved fingers and very long arms, like a chimpanzee, but their digits were short, like humans. The two skeletons discovered, an adult female and juvenile male, aren’t the famed missing link, but they might be as close to it as we’ll ever get, and they provide a great number of clues as to why mankind made the leap from Australopithecus to Homo. More importantly, they’re suggesting that the Cradle of Life is the best place possible to look for the link between humans and our ape ancestors.